The Kremlin is the most popular sight in Moscow. Absolutely all guides show visitors the Tsar Bell and the Tsar Cannon, Taynitskaya (Secret) Tower and the Armoury Chamber. But the Kremlin plays host to some sights that are quite difficult to spot. RIR has looked behind all doors to discover what secrets are hidden in the Kremlin’s thick walls. The Moscow Kremlin retains some feathered employees on its staff: a couple of hawks, a few sparrow hawks and a big owl. Their duty is to organize a territorial system of bio-defense and control the local crow population. It turns out that tourists are not the only ones to get distracted by the blinding sparkle of the Kremlin’s domes. The latter’s precious luster has one particularly treacherous enemy: Moscow crows. They use the golden leaf of the cathedrals’ domes (which is as slippery as ice) as if it were a slide at a water park, scratching it on their way down with their claws. After a protracted and painful war against these feathered vandals, a solution was finally found: an ornithological commando unit was installed in the Kremlin. The hawks’ court is at the base of the Taynitskaya Tower. It is hidden from the eyes of passersby but it’s easy to find if you know where to look. There is also a winter aviary for the Kremlin’s feathered security: it is embedded in the walls between the Nabatnaya and Spasskaya towers. When birds join the ranks of the Kremlin security forces, they are totally unprepared to accomplish the task before them. Therefore, they go through a special training regimen based on a unique method devised by the Federal Protective Service (FSO), Russia’s security service in charge of protecting officials. Hawks and sparrow hawks have their own commander, who sits in a separate “office;” its aviary is larger and set back from the birds’ common court. There is also a lone, strong owl. A special project of the FSO, he is something like a guardian angel of the Kremlin. The Kremlin’s ornithologists call him “Filya,” which is appropriate as “filin” is Russian for “owl.” When he joined this security corps a new tactic was devised for crow hunting: the hawks and sparrow hawks, headed by Filya, attack the enemies from all sides with lightning speed. In Soviet times religious buildings in Russia were ruthlessly destroyed or reconfigured as warehouses, museums or archives. This destiny also befell the Voznesensky Monastery in the Kremlin. Its demolition caused unprecedented opposition within society and well-known figures from around the world wrote letters to Stalin. However, despite the outcry, the monastery was demolished. Today its previous location in the Kremlin is recalled as an empty rectangle next to Spasskaya Tower. However, few know that the historic iconostasis of the Voznesensky Monastery, which has been preserved, can be found in the Patriarch’s Palace. Despite having little time to save the church’s cultural valuables, the employees of the Armoury managed to save the iconostasis of the tomb of the Grand Duchesses and of the tsarinas. They also managed to save the relics of St. Aleksiy. One of the most important relics of the Kremlin, they are now on display in the Bogoyavlensky (Epiphany) Cathedral. The State Kremlin Palace was built in the 1960s and has been declared a cultural heritage object. Apart from hosting sociopolitical forums, it is also used as a venue for concerts and theatrical productions and is where the Kremlin Ballet Theater calls home. Every winter it hosts Russia’s main holiday tree celebrations for children. The palace, of course, has its own secrets. Few know that a restored belfry with a “blagovestnik” (the largest bell in the traditional Orthodox set of bells), which weighs several tons, is stored under its stage. It was cast at the beginning of the 20thcentury and installed here during the palace’s construction. The Kremlin’s Poteshny Palace is hidden from the eyes of visitors next to the Kremlin’s western wall, between the Komendantskaya and the Troitskaya towers. It was here that Tsar Aleksei Mikhailovich, nicknamed “the quietest one,” once allotted a narrow lot between the fortress wall and the living quarters of the Tsar’s palace to his father-in-law, the boyar Miloslavsky. After Miloslavsky’s death his estate was transferred to the Tsar’s treasury. It was connected to the Tsar’s Palace through a stone passage. From 1672 its chambers began to host “potekhi,” the first theatrical representations in Russia. As a consequence, the chambers got the name of Poteshny Palace. Nowadays it is the seat of the Kremlin’s military headquarters. 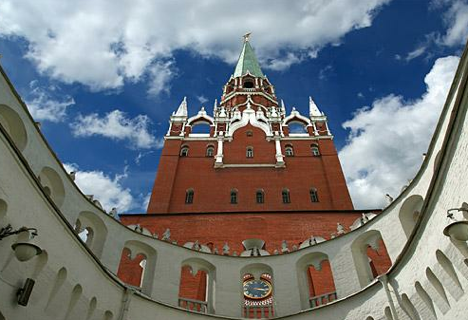 It turns out that in the Kremlin’s Troitskaya Tower there is a modern recording studio. The main rehearsal hall for the Presidential Orchestra, a musical ensemble that performs during official state events, including the inauguration of the President, is also located here. It is one of the few military orchestras in the world that includes symphonic musicians. Its soloists know the national anthems of most of the world’s countries. The Presidential Orchestra has performed with famous musicians of all stripes, even those whose repertoire has little in common with classical music, such as Ken Hensley and bands like Uriah Heep, The Scorpions and Russian hard rockers, Aria. This musical ensemble has recorded music for more than 40 films, as well as theatrical plays and sporting events, including the 1980 summer Olympic Games in Moscow.